As the weather was very good and very hot here a lot of people come to Shirahama. It had been almost cloudy in Shimoda until yesterday but it was a really summer today. I want to get into the water too. 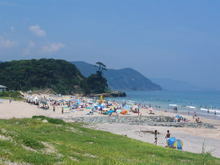 This entry was posted in beach on 2008年7月12日 by izusakuraya.